The HDR-TG1 also incorporates face detection technology for both video and still image. 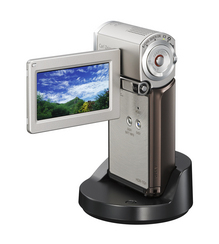 It can identify up to eight faces in the camcorder’s 2.7-inch touch panel LCD screen, and automatically adjust focus, exposure, color control for natural-looking skin tones, and when photos are taken, flash control. The model also allocates more encoding bits to a detected face during the encoding process for the best possible picture when people are the subjects. Audio is recorded in Dolby Digital 5.1-channel surround sound and features a built-in zoom microphone. The HDR-TG1 camcorder will ship with supplied accessories in May for about $900. The HDR-TG1, and similar camcorders, are really pushing down the entry level for HD, putting it into the range of most podcasters. Can you imagine carrying your HD camera in your pocket?